Module UM Wheel/Rail Wear is intended for simulation of wheel and rail wear . The wear of railway wheel and rail profiles is a fundamental problem in railway industry. Many research works have been performed on the prediction of the evolution of wheels and rails due to wear using numerical simulation. Such kind of studies implies using complete models of the railway vehicle/track interaction dynamics, wheel/rail contact and wear. The methodology of the evolution of wheel and rail profiles due to wear consists of the selection of an appropriate simulation set, the simulation of the railway vehicle/track interaction dynamics, and updating profiles according to using wear model. Additional materials. Simulation of wheel and rail wear in Universal Mechanism software um_wear_eng.zip, (12 Mb, zip-archive of PowerPoint presentation). 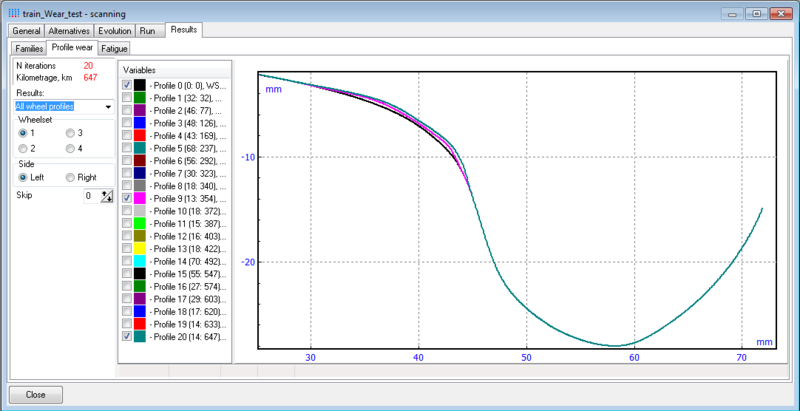 The parameters of simulation set specify operational conditions of the investigated object. In other words, for the prediction of wear of railway vehicle wheel profiles they could be different track sections (tangents, curves and switches), velocity values, rail profiles, track irregularities and so on. Weighting coefficients should be assigned for the parameters. So the simulation set should properly coincide with real operational conditions of the considered vehicle. In UM, a three-dimensional multibody model of any railway vehicle can be developed as well as any railway track including tangents, curves, and switches can be created. To obtain reliable results of railway dynamics simulation and the prediction of wheel and rail wear it is necessary to use adequate wheel/rail contact models. The well-known FASTSIM algorithm  in which the contact patch is supposed to be elliptical. The non-elliptical wheel-rail contact model  where the elastic Winkler foundation model is used to find the contact patch and the distribution of the normal pressure. Sequential approach. In this case, the first step is the simulation of the railway vehicle dynamics and the accumulation of wear for all cases from simulation set. The second step is updating profiles according to the accumulated wear. Such wear iterations are repeated until the desired wear is obtained. Parallel approach. The simulation of vehicle dynamics and the evolution of profiles go on simultaneously. The profile updating is performed during the simulation in some very short time intervals and after the simulation continues with new profiles. As a rule, the maximal material removal in the process of profile evolution is limited by values about 0.1 mm to obtain rather smooth profiles without “digging holes”. Therefore computing high worn profiles by using the sequential approach demands hundreds and even thousands of wear iterations. For detailed simulation sets with many parameters and complicated railway vehicle models it requires days of computational time. The parallel approach allows obtaining high worn profiles much faster, but this approach is not as flexible and stable as the sequential one. Both these approaches are realized in UM. The first example is the simulation of mutual wear of wheels of a freight car and rails in the curve R = 300 m. The sequential approach with 80 wear iterations was implemented for this simulation. In figures, the wheel and rail profiles as well as typical contact patches, which are calculated with the help of the non-elliptical contact model, for 1, 20, 40 and 80 iterations are shown. One can see that for the initial profiles the contact patches are very close to elliptical. In the sequel contact patches differ from elliptical ones more and more and contact becomes conformal during the simulation. 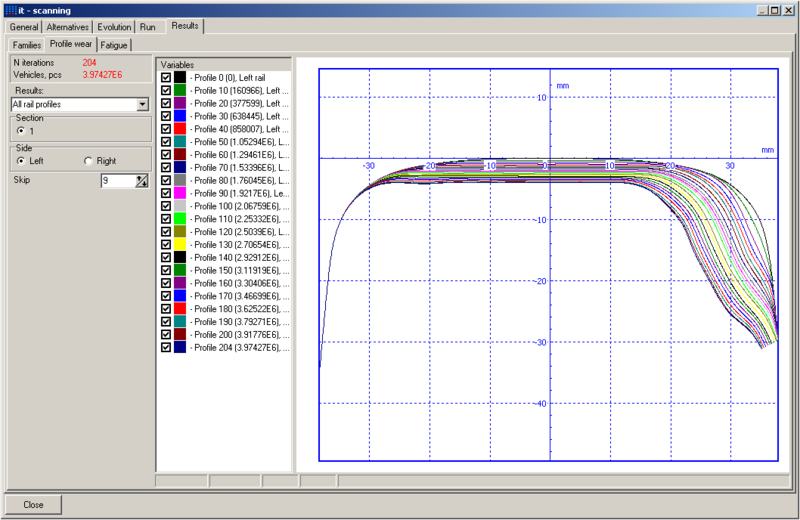 The Example of rail profile wear calculation in curve R=300. Total number of iteration is 204. Every tenth and last rail profiles are shown. User’s manual and presentation are available on Download page.